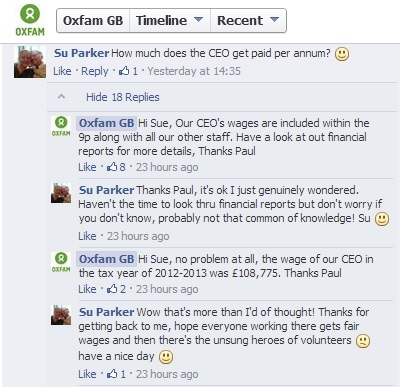 There is a lot of debate around how charities spend their money. Money that is, for the most part, donated by the public. So why shouldn’t donors know how their money is spent? 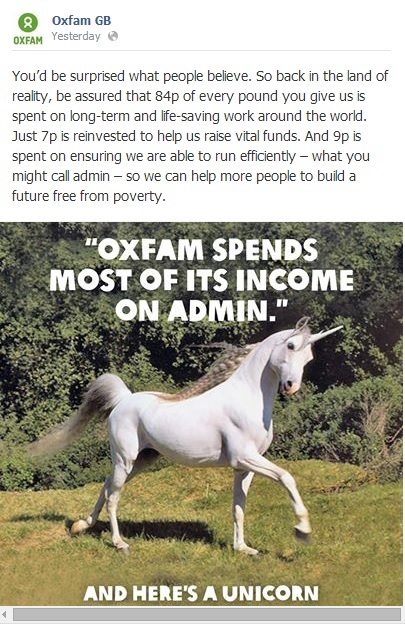 Charities don’t always do a good job at being transparent so when I spotted this on Oxfam’s Facebook page I was impressed. 1. They have used simple stats that everyone can understand. There’s no having to do the maths in your head to work out what’s spent on admin costs. 2. They are replying to comments, both positive and negative. 3. They are signing comments off with a name. An actual person. Not ‘Oxfam GB’. 4. They’re prepared. They must have known this would take off and they have factored that in and comments are being replied to in a timely fashion. I’d be interested to know your thoughts on how charities could be better at being transparent. ← Are you a Comms Hero?